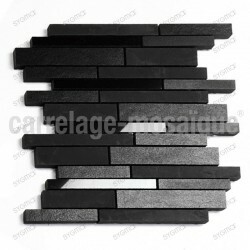 Specialist of the wall and floor covering, carrelage-mosaique.fr offers a wide range of products, centered around the tiles and mosaics. 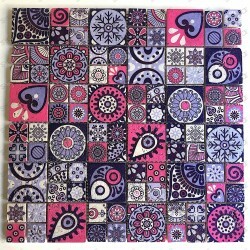 For each of the products offered, the focus is on quality and diversity. 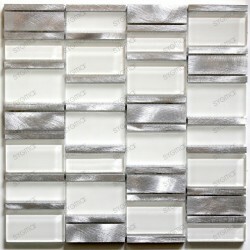 Some are exclusive models that will bring your interior an original touch and affordable price. 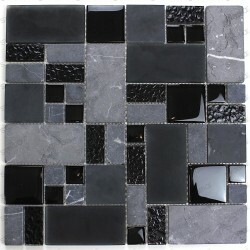 Cheap mosaic items are scarce. We remediate by offering products accessible. These are specially designed to resist moisture as well as shocks. They will find their place easily in your kitchens or bathrooms. The rest of the house is however not marginal because many products are suitable for other parts as well as outside. With no less than a hundred references, there is no choice, especially since there is a considerable variety of styles, finishes and colors. Whether you are looking for a specific shade, a precise finish (gloss, matte, mirror ...) or a well defined material (stainless steel, aluminum, glass, wood, stone and even mother-of-pearl), it is not the choice that is lacking ! Revamp your home with ease by selecting the model that suits you best and imagine your home sweet home transformed. 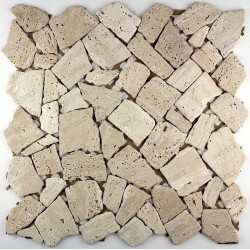 This type of tile is particularly suitable for use in damp rooms but can also be used in dry rooms. 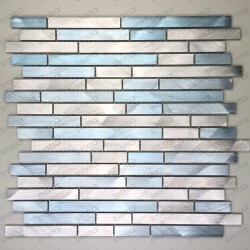 An easy way to give a second breath to your bathroom faience or the credence of your kitchen. Covering your walls is no longer limited to wallpaper whose choice is sometimes limited in these wet rooms. 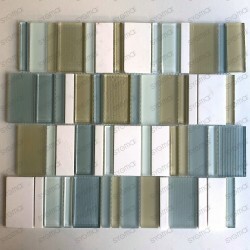 In addition to the bathroom tile and kitchen to replace your faience or the interior of your shower, you will find listels and friezes to further customize your selection. In stainless steel. 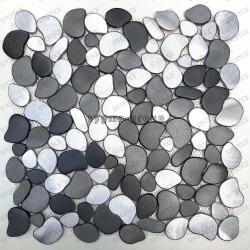 Used very frequently by the professionals of the hotel industry, these pieces allow a very contemporary rendering and are declined in tiles of several dimensions. In aluminium. Highly resistant to shocks, water-repellent and flame retardant, it also has the ability to send back light and enlarge the space. 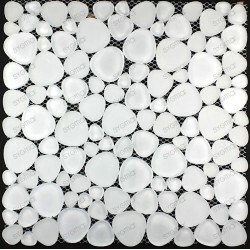 In glass or glass paste. Much used for bathroom coverings, the wide choice of colors and its light-filtering transparency never leave you indifferent. A classic that we never tire of. In wood. Perfectly in tune with the current Scandinavian trend, this aspect will offer you a comforting and warm interior. 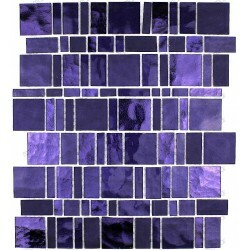 In mother-of-pearl. Much used for wet rooms, mother of pearl and its iridescent side will give a very marine and natural atmosphere to your bathroom. In stone. The natural materials dominate the decoration market, the stone will confer an authentic but nevertheless very contemporary atmosphere to your walls and floors. 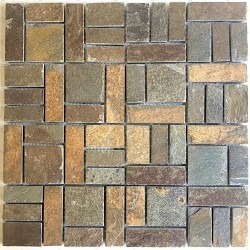 To facilitate your choice, we offer our customers samples of some mosaics at a lower price. 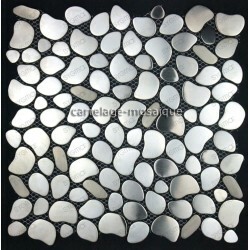 Stone mosaic for splashback, shower, bathroom. 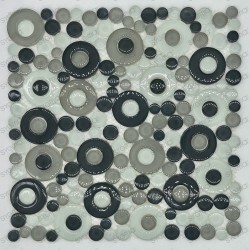 Mosaic - tile ® offers a range of products specially adapted for your splashback of kitchen glass or your soil and shower walls. 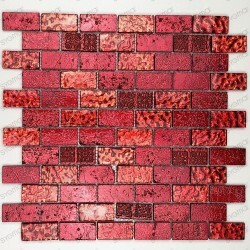 You will find glass of glass mosaic tiles and glass tiles. Delivery in colissimo:France: 48-72 hoursEurope: 4-5 days. 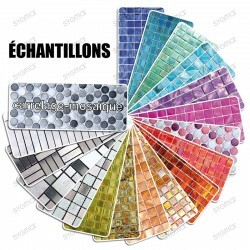 Mosaic of patterned glass plate model RAINBOW oil Trend par excellence for wall coverings, glass in will make you see all the colors. It now found everywhere, but especially in our kitchens and bathrooms where its finish glossy illuminates the room. Modern or classic, cement tile displays a perfect aesthetic and presents a very significant life expectancy. 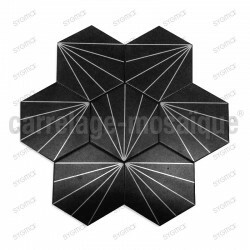 An excellent solution to decorate your interior with material revisits.each tile cement is factory has the hand, so each piece is unique and handmade, it even not an imitation porcelain, but a true cement tile. Or you can pick-up your order in our showroom. Lines open from Monday to Saturday 8am til 6pm. Payplug for credit cards, Paypal, bank transfer or check.